A UN convoy has successfully delivered aid to the rebel-held area of Eastern Ghouta in Syria which has been under intense bombardment, officials say. For the first time since Monday, food supplies got into the town of Douma, the Red Cross said. It follows a pause in Syrian government air strikes overnight, with the situation in the besieged enclave on Friday described as "calm". 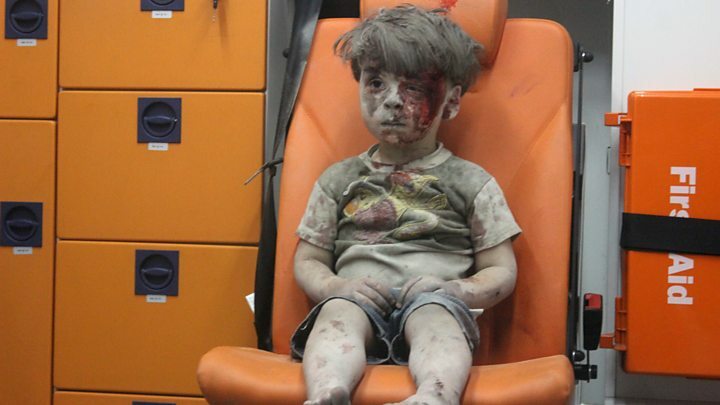 A previous delivery of aid to the region was cut short amid shelling. A spokeswoman for the International Committee for the Red Cross (ICRC), Ingy Sedky, said the delivery on Friday consisted of aid that the convoy failed to deliver during an attempt to reach civilians on 5 March. "We also have some positive indications that a bigger convoy with additional supplies including medical items might happen next week," Ms Sedky added. It was the third attempt this week to get humanitarian aid to civilians trapped by the fighting in the region on the edge of the Syrian capital, Damascus. There were fears that the latest effort might also be abandoned after reports of renewed shelling near Douma shortly after the trucks entered the enclave. Ali al-Zatari, the UN humanitarian co-ordinator in Syria, said any bombardment of the area during aid deliveries would breach "assurances of safety from parties including the Russian Federation", AFP news agency reports. On Monday, a convoy of 46 trucks delivered some provisions to Douma but was forced to turn back. A second attempt was later made to deliver the aid that agencies had failed to offload, but this was cancelled at the last minute due to security concerns. 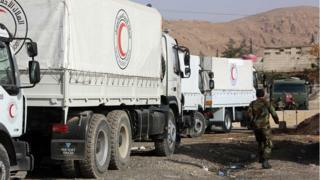 While ICRC officials said that the latest convoy had successfully delivered its cargo, humanitarian organisations said it was not nearly enough aid for the estimated 400,000 people trapped in the area. More than 900 civilians have been killed in the Eastern Ghouta region since the Russian-backed government assault was launched on 18 February, according to the UK-based Syrian Observatory for Human Rights (SOHR) monitoring group, which has a network of sources on the ground. 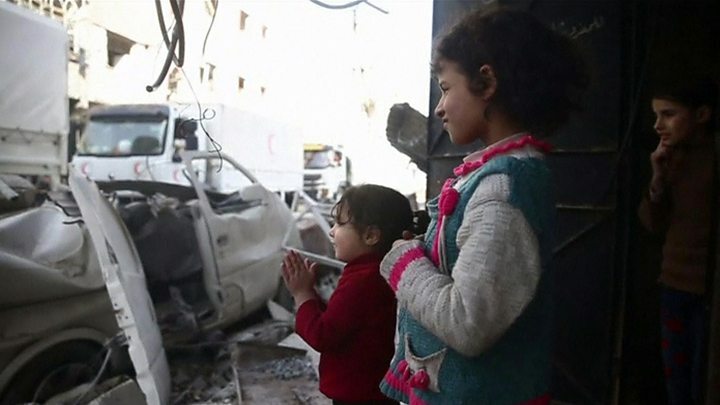 Media captionFootage shows an earlier aid convoy reaching "hell on earth"
On Friday, the air strikes reportedly ceased briefly, with the enclave seeing its calmest night in more than a week, the SOHR said. The Syrian government and its key ally Russia say a daily five-hour pause, which began in principle last week, does not apply to the targeting of some of the rebel groups within Eastern Ghouta. Forces loyal to the Syrian government have now reportedly taken half of the area - the last rebel-held enclave close to Damascus.